Routes from New York to Chicago.—Towards New York, as the metropolis of the United States, all railroad lines converge. It was for me, as it will be for most others, the starting-point for the journey overland. I took the usual route—that in which Chicago and Omaha are the principal midway stations. Some, for special reasons, go by way of St. Louis, thence reaching the Union Pacific Railroad either by way of Omaha, or, taking the Kansas Pacific Railroad, by way of Kansas City and Denver. The Chicago route is the more direct however, and is unquestionably better in all respects. There are four separate routes from New York to Chicago or St. Louis. These routes take their designations from those of the great railway companies which, by the process of ‘amalgamation’ or otherwise, have acquired control of the lines lying between their own original termini, and the distant points on the Mississippi River and the Lakes. The most northerly of these routes is the ‘New York Central;’ next, south of it, is the ‘Erie;’ next, the ‘Pennsylvania;’ next, the ‘Baltimore and Ohio.’ The respective merits of these several routes need hardly be a subject for discussion, the standard of carefulness in management of trains, speed attained, and provisions for the comfort of passengers being as nearly as possible the same in all. The choice of routes is therefore usually determined simply by the inclination of the traveller, who, as the lines traverse widely divergent paths to their common termini, may prefer to view one section of country, or one prevailing class of scenery, rather than another. Without attempting to lead the reader to a conclusion as to which route should be chosen, some account of the prominent features of each seems requisite. The ‘New York Central’ Route.—The railroads comprising this route are the New York Central and Hudson River Railroad, to Buffalo; and, thence, by way of Cleveland, the Lake Shore and Michigan Southern Railway, or, by way of Detroit, the Great Western Railway of Canada and the Michigan Central Railway to Chicago. The scenery to be viewed in the journey from New York to Albany (144 miles), directly along the banks of the Hudson River, has become celebrated as being among the finest in the world. The River takes its name from Hendrik Hudson, the Dutch navigator, who was one of the earliest explorers of this part of the New World. New York City, having outgrown the bounds of Manhattan Island, is now extending itself for several miles along the banks of the Hudson. Looking across the broad bosom of the river, which is here about two miles wide, the traveller’s attention is attracted by the palisades; the high perpendicular cliffs, which form the western bank of the stream, extend for about two miles, and are an unfailing cause of wonder and interest. All along the river on the eastern side lie country mansions and cottages of the merchant princes and the old Knickerbocker families, the elegant retreats of thousands noted for their wealth or for success in business, politics, or literature. The landed estates are extensive and highly cultivated. The river is navigable as far as Albany, Beyond Albany, the traveller by this line passes through the Mohawk Valley, famous as an agricultural region; and hence, as will be observed by reference to the map, he will find a continuous chain of cities and large towns as far as Niagara Falls. This is one of the most important, most populous, and wealthiest sections of the Union. The Erie Canal, the greatest public work of its day in America, will be frequently seen on the way from Albany to the Falls. New York is called the ‘Empire State,’ having held a more numerous population, and, until the admission of Texas, having been larger, than any other state of the Union. The controlling interest in the New York Central and Hudson River, and other railroads, in this state is owned by one man, Cornelius Vanderbilt, usually called the ‘Commodore.’ From an humble beginning as simple captain of a passenger boat on the Hudson River, he has added to his wealth, during a long and busy life, until now, at about seventy-five years of age, he is regarded as one of the three richest men in America1—his fortune being roundly estimated at $80,000,000, or 16,000,000l. The main line under his control, from New York to Niagara or Buffalo, is 441 miles in length, has a double track, and with its various branches and sidings is 845 miles of railroad. It is admitted to be one of the best managed railroads in existence. The ‘Commodore,’ by the way, is credited with the exertion of great energy and ability in checking wastefulness in the operation of the roads, in taking care to have no useless servants, and in securing the highest possible dividends in the shape of income from these great properties. 1William B. Astor, $200,000,000, or 40,000,000l. Alexander T. Stewart, $50,000,000, or 10,000,000l. The ‘Erie’ Route.—All the world, it may be safely assumed, has heard something of the Erie Railway, the management of its affairs in the days of Fisk and Gould having been such as to secure for it a very undesirable kind of notoriety. A greater amount of English capital was absorbed in its construction than in the case of any American railroad, with perhaps one or two exceptions. For a long time after its completion it was a favourite line; the American travelling public resorting to it as a more direct route between New York and Buffalo, and as affording views of the singularly interesting scenery in the semi-mountainous country in southern and south-western New York—the region of the Catskills, the farther Alleghanies, and the picturesque slopes drained by the head-waters of the Delaware and Susquehanna Rivers. The road has been distinguished also by its broad gauge, the width of its tracks and those of its principal auxiliary, the Atlantic and Great Western Railway, being six feet, while the prevailing gauge of American railroads is four feet eight inches and a half. The broad gauge adds somewhat to the steadiness of trains in motion, and admits of more liberal allowances of space to passengers in cars— conveniences which are well appreciated by the Yankee public, which is accustomed to enjoy a degree of luxury in travelling to which the people of other nations are strangers. When, however, the Erie Railway was taken into politics, under the Tweed régime, and when its managers, driven by the exigencies of their speculations in the Stock Market, began embezzling portions of its earnings which should have been devoted to keeping in good repair its tracks and equipment, prudent and well-informed travellers, fearful of accidents or delays, avoided this route. Under a new management, Erie is rapidly recovering its good name and all its former popularity. The connexions of the Erie Road, at its western end, and their location with reference to it, give it some peculiar advantages. 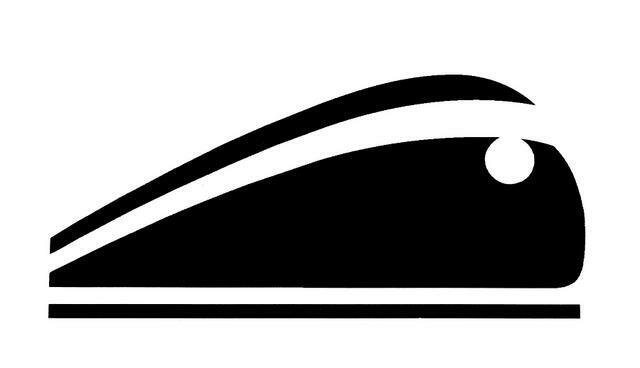 Thus, just before reaching Buffalo, the traveller may take the Atlantic and Great Western Railway for Cincinnati or St. Louis; the Lake Shore and Michigan Southern Railway, for Chicago; or by Niagara, the Great Western Railway of Canada, for Detroit, and thence by the Michigan Central Railway to Chicago. On account of these and other facilities for distribution of passengers, the Erie is called upon to transport the greater part of the immigrants passing through New York to the West. The ‘emigrant trains,’ as they are called, are run at a lower rate of speed, and at much lower fares, than those used for general travel. The ‘Pennsylvania’ Route.—The Pennsylvania Railroad is the giant rival of the New York Central—the struggle between these two for supremacy overshadowing other contests throughout the whole length and breadth of the railway system of the United States. They are the chief competitors for traffic between the Eastern and the North-Western States, between New York and Chicago, St. Paul, Omaha, St. Louis, San Francisco, and all the regions of the Far West. The war between them is waged in New York City, all through the broad states of Ohio, Indiana, Illinois, and beyond to the great plains; each seeking control of connexions and tributary lines to the exclusion of the other. The Pennsylvania Railroad Company1 represents one of the largest aggregations, with the most compact organisation, of capital in the hands of a few private individuals that has ever been known to history. The road, as originally built and operated, was less than 400 miles in length, its main line extending simply from Philadelphia to Pittsburg—those great cities lying at opposite ends of the state of Pennsylvania. The Company has acquired control, by purchase or lease, of lesser and tributary lines on every side, so that its branches ramify the state in every direction, collecting the greater part of the product of the mines of coal and iron for which Pennsylvania is noted all over the world, as well as the products of her vast and fertile farming districts, and of the ‘oil region,’ and distributing to all parts of the Union the manufactures of her iron-furnaces, rolling-mills, &c. It now owns, or controls by leases (generally for ‘999 years’), about twenty separate railroads in the state, the aggregate length of the tracks being very nearly 1,700 miles. Needing outlets of its own to New York, it has recently leased, ‘in perpetuity,’ the railroads of the United Companies of New Jersey, acquiring three separate lines across that state to New York. Needing a direct connexion with Chicago, it built, some years ago, the ‘Pittsburg, Fort Wayne, and Chicago’ Railway (370 miles). It controls connecting lines to Cincinnati and St. Louis, contends with the New York Central for the control of the Union Pacific Railroad, is acquiring lines reaching out to the South-West, and is chiefly supplying the means for the construction of the new transcontinental road, the Southern Pacific, or, as it has been more recently named, the Texas and Pacific Railway, which is now in course of construction in Texas toward the Rio Grande. The master spirit of this vast combination is Thomas A. Scott, the Vice-President of the Company—younger by nearly twenty-five years than ‘Commodore’ Vanderbilt, but, like him, risen from a very humble station in life, without the aid of inherited wealth or family influence. 1I use this designation as synonymous with Pennsylvania Company, which is in fact a distinct corporation engrafted upon the Pennsylvania Railroad Company. The same gentlemen manage the two companies, and their interests are identical. Pennsylvania is called the ‘Keystone State,’ taking its name, it is supposed, from its location among the original thirteen colonies. In area and population it ranks next after New York. The main line of the Pennsylvania railroad traverses the state centrally, and therefore crosses the successive ranges of the Alleghany Mountains, which rendered the building of the road a work of vast labour and expense, and often involving difficult engineering problems. As will be readily imagined, the scenery here is exceedingly varied and pleasing, the prevailing outlines being rugged, bold, and picturesque. Philadelphia, the second city in the Union as to population, is first in amount of manufactures. Its streets are laid out with perfect regularity, at right angles to each other. The city is remarkable for the great extent of the area it occupies, the thrifty citizen generally taking care, in building, to provide simply for the accommodation of his own family, and to secure, if possible, a little inclosure about his house for planting shrubbery. The area of Philadelphia, with a population of 700,000, is 120 square miles; while New York, with a population of 1,000,000 covers only 22 square miles; and London, with nearly 4,000,000 population, occupies 125 square miles. Pittsburg is at the head of navigation on the’ Ohio River, is the principal point of shipment of Pennsylvania coal and iron to the West and South, by rail and river, and is conspicuous for its iron and steel works. The ‘Baltimore and Ohio’ Route.—The traveller to the West or South-West by this route goes by the Pennsylvania Railroad to Philadelphia; by the Philadelphia, Wilmington, and Baltimore Railroad, to Baltimore; by the Baltimore and Ohio Railroad through Maryland, Virginia, and West Virginia, to Parkersburg, on the Ohio River (384 miles); thence by various lines to Cincinnati, St. Louis, or Chicago, and beyond. Many tourists take this route in order to visit Washington, the capital of the United States, which is reached by a détour of two hours’ journey. The Baltimore and Ohio route is manifestly less direct than those which have been named, and cannot be said to present so great attractions for the sightseer, unless he be specially interested in the section traversed. The Baltimore and Ohio Company is in the thick of the fray among the competitors for the patronage of travellers by rail, and has been very successful in securing control of connecting lines, both westward and southward. Its affairs are ably administered, and its President, John W. Garrett, holds an eminent position among the railway magnates of the country. 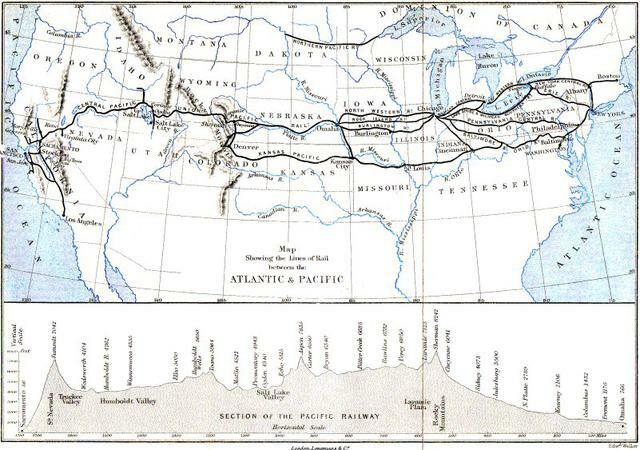 These routes are to be regarded as not merely thoroughfares for passenger travel between the East and West, but as the great channels through which pour the overflowing products of the Middle and Western States, seeking markets in the cities of the seaboard, or destined for shipment to foreign countries. They are the great arteries through which surge the tides of travel and traffic to and from the immense, basin-like interior of the continent—a marvellously fertile and increasingly populous area, bounded on the east by the Alleghany Mountains, and on the west by the Rocky Mountains, and known as the Mississippi Valley. The westward-bound traveller by either of the routes cannot fail to share the general and strong impression of the magnitude of their operations which grows from observation of their numerous and often overburdened trains, the long distances traversed, the armies of employés, and the gigantic works built for the crossing of rivers and mountains. The ambition of their managers is, apparently, to bestride the continent like a Colossus. Americans themselves are sometimes startled when suddenly brought to contemplate some development, some evidence of far-seeing design, in railroad combinations, involving the use of capital amounting, it may be, to a hundred millions of dollars for the launching of new lines through regions where the Indian and the buffalo are still the principal inhabitants. The railroads which thus thrust their tentacles beyond the frontier (if there be any frontier still remaining in America!) are simply acquiring a growth commensurate with the advance of settled communities across the continent. In earlier days, national thoroughfares extended only from the Atlantic coast to the Alleghany Mountains, or, like the Erie Canal, to the Lakes nearest the coast; and, later, the National Road (a wide turnpike) extended hardly as far as Illinois. Now, ‘through’ routes must extend from ocean to ocean, and the four main lines, previously described in this chapter, in effecting consolidations with other lines to the westward, or in building new ones in that direction, are fulfilling what Americans are accustomed to call, with profound significance, their ‘manifest destiny.’ The lines from New York will find their parallels, on an enlarged scale, in the Union and Central Pacific—already built— and in the Northern Pacific, and Southern Pacific, which are now in course of construction. At present, however, and for some years to come, the tourist who sets out from New York for the Pacific coast will understand that of the four routes named each will lead him to the Union and Central Pacific Railroads. I assume that my reader will determine for himself which of the routes from New York is to be selected, and that he will hasten forward with me to the less frequently described regions of the West. He will, if he chooses, embark from Boston rather than New York, making close connexions thence to the main line of either route. He may stop at Niagara Falls, if he takes either the ‘New York Central,’ or the ‘Erie’ route. He should not omit to see Buffalo, at the eastern end of Lake Erie, a great grain mart, and one of the largest of interior American cities. Ohio, Indiana, and Michigan he will discover to be great and populous states, consisting chiefly of level agricultural lands now and for long cleared of the chief part of the forests which the farmer-settlers found there. He will hear, along the way, of the wonderful prosperity of Cleveland, Detroit, Toledo, Indianapolis, Columbus, and other cities, the names of which, if a foreigner, may be new to him, but which, by their populations ranging from 50,000 to 100,000, will be found intitled to places in history. If he passes through Toledo, he is sure to be told of a ‘reach’ of railroad extending 69 miles on his way beyond that city in air line—claimed to be the longest perfectly straight railroad division known. Fellow-passengers will be at hand to tell him, too, of great battles between the whites and the Indians, only a little more than half a century ago, in that region where now are to be seen only peaceful farmhouses and fruitful fields—where even the sight of a real Indian would now attract wondering crowds, among which would perhaps appear, leaning on his staff, more than one veteran relic of the early struggles. He will find cities and towns more numerous than the wigwams of the aboriginal tribes, and a network of railways extending and opening fanlike to the West. The distance from New York to Chicago is about 900 miles by either route, or twice the distance from London to Glasgow. The passenger express trains accomplish the journey in a little over thirty hours; so that, leaving New York in the evening, as is usual, one arrives at Chicago on the second morning following. The ‘through’ trains are all provided with drawing-room cars and sleeping-cars—those ‘American institutions’ which, for the first time in the history of civilisation, have rendered travelling as comfortable as staying at home. Thus much respecting the journey over the familiar ground of the Eastern States. I have not attempted in the preceding pages to present such a direct narrative of my personal experiences and observations as I contemplate for the journey beyond Chicago. I have hoped to present, even at the risk of being thought tedious and of restating many well-known facts, a brief preliminary sketch which may prove of some interest to the general reader, rather than of special value to the actual tourist. The first stage of the overland trip terminates at Chicago, at which wonderful young metropolis it is well to tarry a day.